Two years ago Clabby Analytics wrote a report that evaluated Cisco’s Unified Computing System (UCS) and revealed shortcomings in the UCS design, stating that Cisco blade environments are “good enough” computing environment. Since then Cisco made improvements to their system design, but the blade market didn’t stand still waiting for them to catch up as IBM announced a new system design: the IBM Flex System. 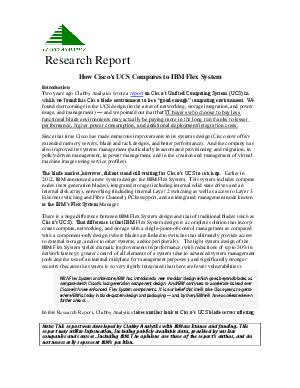 Continue on to this new assessment from Clabby Analytics that compares Cisco’s UCS blade server offering to IBM Flex System’s in a soup-to-nuts evaluation. Also find out how these two major players compare to the competitors in the blade marketplace.